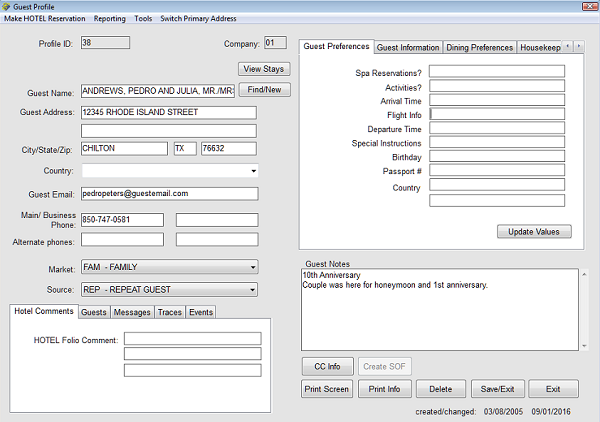 Guest Profiles are great tools for marketing, recording and serving guest wishes, creating popup traces, printing a variety of reports, tracking guest history, quickly accessing reservations and folios, and other needs you might have. All of the information is exportable. Below is a guest profile screen. Below it are some notes. Guest Name by default is one field. Typical entry is LAST, FIRST, SALUTATION or LAST/FIRST/SALUTATION. There is an option to pop up a little window into which you would enter the salutation, first name, and last name into separate fields. This option is set in the MENUINI configuration. In most cases this is unnecessary. Country - the default setting is a free-form field where users may type the information as they wish. If you need to select countries from a drop-down, let us know and we will send you instructions on the file to be imported. This may be necessary if your marketing includes country parameters. For example, one user might enter ENGLAND, another BRITAIN, another UK, and so on. If a dropdown is used, the entries will be uniform. Email - if you require email address, this becomes a required field. For guests not wanting to provide email or when it is unavailable, you will enter "na". You can turn the email address requirement on or off in Guest Profile Tools. Market and Source will be selected from the dropdown. If you type the code the item will display and you can press Enter or scroll to it and press Enter. Hotel Comments - the "HOTEL Folio Comment" by default prints on the folio, confirmation letter, and registration form, so do not include entries you would not want the guest to see. This can be disabled. The second two comments do not print by default but printing them can be enabled. Guests - you may enter additional guest names, phone numbers, and email addresses. Messages - you may enter a message for the guest. Any time the profile is opened, a popup will notify you that there is a message until "message viewed" is clicked. Traces - you may enter a trace for other staff members. Any time the profile is opened, a popup will notify you that there is a trace until "message viewed" is clicked. 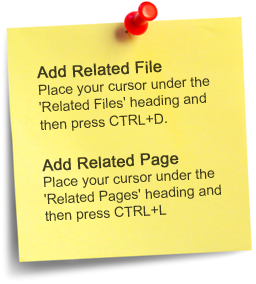 Traces can be entered for any date and the traces can be included in the Trace Report. Auto-traces can be created so that they automatically exist for defined market segment guests and will print on the Trace Reports. Events - this is not typically used, as it imports an Outlook calendar which must be maintained. This Outlook calendar applies to all guests. These tabs can be renamed. You may have up to five. The first two may be created with fields to populate by the users, such as "Passport #". See Guest Profile Tools. The information in any or all of these tabs may be included in the "Preferences" Report. Guest Notes will print on the Reservation Status Reports but do not print on anything that the guests see, such as confirmation letters, folios, and registration forms. Below is the Profile Entry and Lookup. 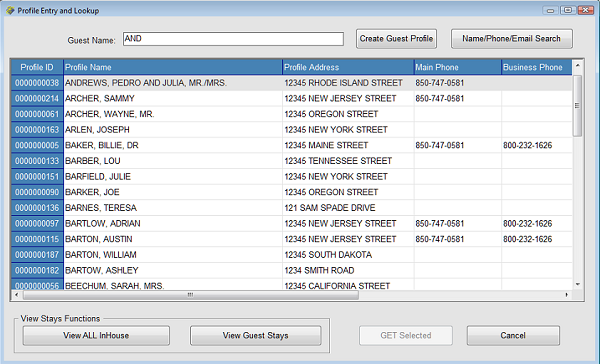 As you start typing the name, the system will look for matching guests. If you do not see the guest's profile, you can create a new one. If you see the guest you are looking for, you can "view guest stays" to see the in-house folios, past stays, reservations, cancellations, and no-shows attached to the folio. To make a change to a profile you can click "get selected". "View all in house" will show a list of all in-house guests and today's checked-out guests.. The Guest Profile screen is a tool for you. You do not have to use all of the features. Use the ones that work best for you.